Residual stresses are an important subject in materials science and engineering that has implications across disciplines, from quantum dots to human teeth, from aeroengines to automotive surface finishing. Although a number of monographs exist, no resource is available in the form of a book to serve as a good basis for teaching the fundamentals. A Teaching Essay on Residual Stresses and Eigenstrains introduces eigenstrain methods as a powerful unified approach to residual stress modeling, measurement, and management. Starting with simple residual stress states, the key relationships are elucidated between deformation processes, inelastic strains (eigenstrains) these may introduce, and the resulting residual stress states. 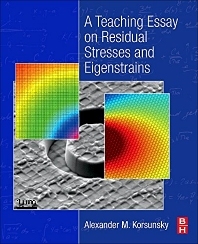 This book is written not only for the materials scientist, mechanical engineer, and student seeking to appreciate the origins of residual stress, but also for the more mature researcher and industrial engineer looking to improve their understanding of the eigenstrain approach to describing residual stress. Professor Alexander Korsunsky is a world-leader in mechanical microscopy and rich tomography of materials systems and structures for the optimisation of design, durability and performance. He heads the Multi-Beam Laboratory for Engineering Microscopy (MBLEM) in the University of Oxford, and the Centre for In situ Processing Science (CIPS) in the Research Complex at Harwell Oxford. He consults Rolls-Royce plc on matters of residual stress and structural integrity, and is Editor-in-Chief of Materials & Design. In the last two decades, Alexander Korsunsky has been the most active proponent of eigenstrain theory for the analysis of inelastic deformation and residual stresses in materials and components. He teaches widely across the world, and each year gives several keynote and plenary lectures at major international conferences on engineering and materials. The broader context of Prof Korsunsky’s research interests concern improving the understanding of integrity and reliability of engineered and natural structures and systems, from high-performance metallic alloys to polycrystalline ceramics to natural hard tissues, such as human dentin and seashell nacre. He has co-authored books on fracture mechanics and elasticity and has published over 300 papers in scholarly periodicals on subjects ranging from multi-modal microscopy, neutron and synchrotron X-ray analysis, contact mechanics and structural integrity to micro-cantilever bio-sensors, size effects, and scaling transitions. Prof Korsunsky plays a leading role in the development of large-scale research facilities in the UK and Europe. He has chaired the Science Advisory Committee at Diamond Light Source, and is member of UK delegation to ESRF Council. His activities expand the range of applications of large-scale science to problems in real engineering practice. Prof Korsunsky’s research has received support from EPSRC and STFC (major UK Research Councils), the European Commission, the Royal Society, Royal Academy of Engineering (RAEng), CNRS (France), DFG (Germany), NRF (South Africa), and other international research foundations, as well as industrial partners, such as Rolls-Royce, Oxford Instruments, and Tescan-Orsay. In spite of the fact that the eigenstrain theory emerged decades ago, only in the recent years it turned out to be a fruitful source of new concepts for modelling various manufacturing processes. Compared to elastic-plastic thermo-mechanical process models, eigenstrain methods of residual stress analysis involves a smaller number of variables and parameters. This property of direct and inverse eigenstrain modelling allows the reconstruction of residual stress fields with high reliability and more modest requirements for computational power. "A Teaching Essay on Residual Stresses and Eigenstrains" is a helpful guide book for students and researchers who want to understand the concepts and practice of eigenstrain theory. Theories are explained in a concise and clear way, and illustrated using a wide range of applications that allow the readers to grasp the ideas underlying the use of eigenstrain theory. Interested researchers will find examples related to their field of interest and may be inspired to bring the benefits of eigenstrain theory to the attention of their students to give them a better understanding of the mechanics of solids and advanced modelling of their behaviour under contract loading, fatigue and creep conditions.